If you take umbrage with a store's return policy, use this printable retail complaint letter and request a change. 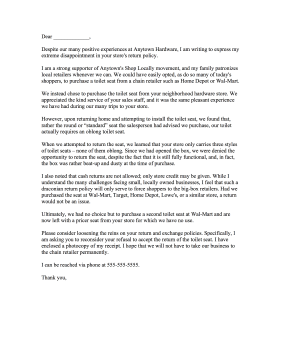 Despite our many positive experiences at Anytown Hardware, I am writing to express my extreme disappointment in your store's return policy. I am a strong supporter of Anytown's Shop Locally movement, and my family patronizes local retailers whenever we can. We could have easily opted, as do so many of today's shoppers, to purchase a toilet seat from a chain retailer such as Home Depot or Wal-Mart. We instead chose to purchase the toilet seat from your neighborhood hardware store. We appreciated the kind service of your sales staff, and it was the same pleasant experience we have had during our many trips to your store. However, upon returning home and attempting to install the toilet seat, we found that, rather the round or "standard" seat the salesperson had advised we purchase, our toilet actually requires an oblong toilet seat. When we attempted to return the seat, we learned that your store only carries three styles of toilet seats - none of them oblong. Since we had opened the box, we were denied the opportunity to return the seat, despite the fact that it is still fully functional, and, in fact, the box was rather beat-up and dusty at the time of purchase. I also noted that cash returns are not allowed; only store credit may be given. While I understand the many challenges facing small, locally owned businesses, I feel that such a draconian return policy will only serve to force shoppers to the big-box retailers. Had we purchased the seat at Wal-Mart, Target, Home Depot, Lowe's, or a similar store, a return would not be an issue. Ultimately, we had no choice but to purchase a second toilet seat at Wal-Mart and are now left with a pricer seat from your store for which we have no use. Please consider loosening the reins on your return and exchange policies. Specifically, I am asking you to reconsider your refusal to accept the return of the toilet seat. I have enclosed a photocopy of my receipt. I hope that we will not have to take our business to the chain retailer permanently. I can be reached via phone at 555-555-5555.